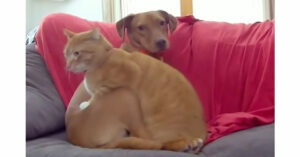 Hidden Camera Caught Cat Cuddling Up to His Dog Friend and It’s the Cutest Video Ever! Joule is a dog that has a really sweet nature. However, he felt very anxious when he was first adopted, so the owner had to make sure that he has someone that can keep him company and ensure the little one’s safety for hours on end. The lady understood that she cannot be home seven days a week, so Joule needed to have a friend that would support him without hesitation. This was when the cat named Kelvin appeared on the scene and stepped up to provide protection for the pup. We have all been hearing the rumors about cats and dogs being too aggressive to live together, but you will soon find out that this has nothing to do with the little ones below. They are destroying the stereotypes on a daily basis and making sure that we know this as well. The guys you are going to see next are the epitome of adorable, and their friendly attitude has already earned them followers on the media. The family knows that the cat and the dog can be left together. They do not mean harm for one another and can easily coexist. Though this is someone that is not typical for the houses with several pets inside, Kelvin and Joule do not seem to mind sharing the bed and treats that they are given throughout the week. Below, you will see the real example of a connection between the animals that will take you back. The duo belongs on a TV show, and we are waiting for the next part of their adventures as time goes by. The owner cannot get enough of their bond, and we think that this is another proof that cats and dogs can actually exist together without the fear of becoming each other’s opponents. Kelvin and Joule are the house pets that do not wish to create a conflict and throw tantrums when they are not in the mood. This is the reason they are getting along so well. Joule needed someone who can help him adjust to the new reality, and when the dream came true, he understood that he can rely on the cat completely. Make sure that you’ve checked out the clip below and be smitten with the relationship between the cat and the pup!